The Honorable Stephen Ostroff, M.D. Consumers Union, the public policy and advocacy arm of Consumer Reports, writes regarding the safety and sustainability of ground beef in the marketplace. According to a Consumer Reports investigation, conventional ground beef is twice as likely to contain multidrug-resistant bacteria – or “superbugs” – as ground beef that is more sustainably produced. These findings were released today as part of “How Safe Is Your Beef?,” in which Consumer Reports examines potentially dangerous bacteria in different types of ground beef and advises consumers on what they can do to make better beef choices. 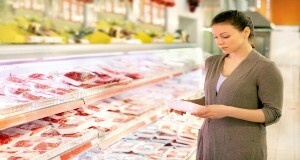 This article explores the risk of foodborne illness, offers safe handling and cooking instructions, and indicates food labels to look for when shopping. Full results of the investigation are available at ConsumerReports. org/cro/beefsafety and in the October issue of Consumer Reports magazine. As you know, ground beef – which makes up about half of the 4.6 billion pounds of all beef bought at groceries and big-box stores over the last year – presents distinct risks. Bacteria can be distributed more widely as a result of the grinding process and because meat and fat trimmings often come from multiple animals. Moreover, Americans often prefer their beef on the rare side, which makes it less likely that meat is cooked properly through to the center. For its investigation, Consumer Reports purchased 300 packages (458 pounds) of conventionally and sustainably produced ground beef from grocery, big-box, and natural food stores in 26 cities across the country. The samples were tested for five common types of bacteria associated with beef: Clostridium perfringens, E. coli (including O157 and six other toxin-producing strains), Enterococcus, Salmonella, and Staphylococcus aureus. This testing, which is among the largest conducted to date, found bacteria on all samples. However, ground beef from cows raised more sustainably was significantly less likely to contain two potentially harmful bacteria (S. aureus and E.coli) than those raised conventionally. In addition, 18% of the samples from conventionally-raised cows contained dangerous superbugs resistant to three or more classes of antibiotics used to treat illness in humans, compared with just 9% of samples from more sustainably-raised cows. In the Consumer Reports analysis, the sustainably-produced beef came from cows that were raised without antibiotics and in some cases were either organic, grass-fed, or both. Conventional cows can live on feedlots and be regularly fed antibiotics, as well as animal waste and other by-products. Consumer Reports supports the important work of the Food and Drug Administration (FDA) to monitor public health as it relates to veterinary medicine. While our specific findings from this investigation can be found in the enclosed report, our overall conclusions prompt us to make the following recommendations to FDA. Prohibit antibiotic use for disease prevention. This practice leads to antibiotic resistance and makes the drugs less effective for treating infections in people. Sick animals should get antibiotics, but producers should improve living and sanitary conditions to prevent illness. We would also like to emphasize – as we did in recent regulatory comments – that while we wholeheartedly agree with FDA on the need for requiring species-specific data on antibiotics sold or distributed for use in food-producing animals, FDA should further expand reporting requirements and disclosure of data on animal antibiotic use so that the public can better understand which type of food animals are given which antibiotics for what purpose. Prohibit chicken waste in cattle feed. Cattle in feedlots are sometimes fed spilled chicken feed and manure gathered from the floors of chicken coops. Since chicken can be fed cattle waste, the spilled feed could transmit mad cow disease when it’s fed back to the cattle. And chicken manure can carry Salmonella and other bacteria. Consumers Union, together with other organizations, asked FDA to stop that practice in 2009, but the agency has not taken action. Crack down on the “natural” label. In June 2014, we filed a petition with FDA and USDA to ban use of the natural label on meat because it is misleading. According to a 2014 Consumer Reports national survey, 60% of consumers believe meat labeled “natural” was raised without antibiotics and that the animal wasn’t given artificial ingredients in its food; 68% think it means no artificial growth hormones. None of that is true. The word “natural” can be used on packages of beef from cattle that were raised on a feedlot, fed genetically modified grain or grain grown with pesticides, or given antibiotics or hormones. Thank you for your consideration of these recommendations. Consumer Reports stands ready to work with you to take action that would bolster food safety and provide consumers with the information they need to make healthy and sustainable choices.